About the parents raising their kids without bedtimes, modern medicine or potty training. Parenting methods run the gamut and we don’t know about you, but we like to get a peek into different strategies and styles because there is no one-size-fits-all version that has worked for us. That being said, the new ‘Off-Grid’ method is a bit out of the realm of most parenting styles and has people talking. Adele and Matt Allen live in Brighton, England where they are raising their two children, Ulysses, age 5, and Ostara, age 15 months with a parenting style known as ‘Off Grid’. Their choice to parent in this way comes with a lot of controversial practices, like not potty training and shunning all medical interventions. Vaccinations are a no-go for their family and Adele, the mother, believes that illnesses like meningitis can be cured naturally. There are other parenting practices that the Allen family participate in which are accepted more widely like long-term breastfeeding, co-sleeping, and letting the kids self-guide their education (Montessori, anyone?). But, it seems that this family takes the bulk of their parenting choices to another level, and some decisions may even be unsafe for their children in the long term. Additionally, in the Allen Family’s quest to self-sustain their life, they are currently using crowd funding with the hopes of moving to Costa Rica where they can buy a plot of land, and “create a business, home and lifestyle which can show people that they don’t have to comply to the constraints of ‘the system’.” This has caused a lot of conversations on their Facebook page, The Unconventional Parent and in the media, to say the least. We don’t think it’s unconventional to enlist the help of your kids around the house. They are capable individuals and at every age, there is something they can do to help keep the family home. 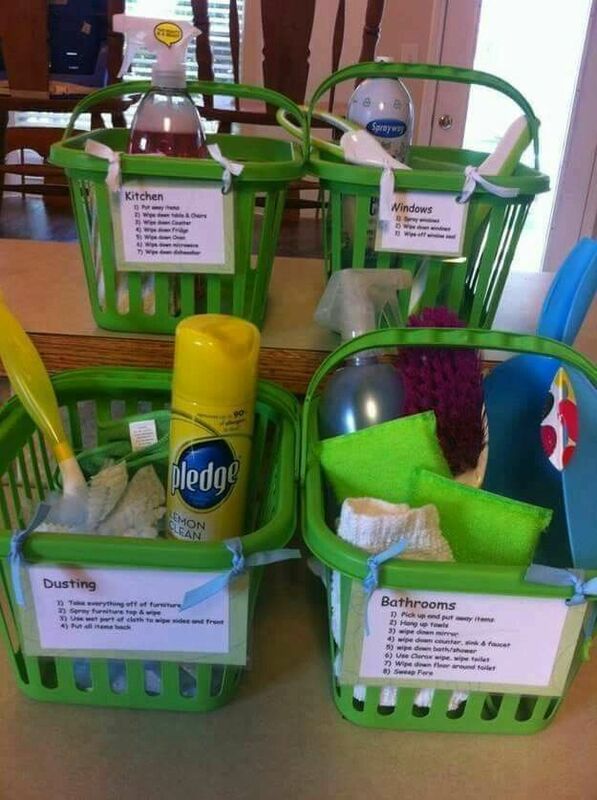 Create cleaning baskets. One basket for each space in the home that needs cleaning with laminated instruction sheets for what’s to be done, fixed to the front of the basket. Fill the basket with the necessary supplies and send your elementary age (and older) children on their way to tackle a space. You may want to walk them through the process the first time, but beyond that, let them own it. Create an incentive based system. One mom created chore popsicle sticks where each chore equates to 5-15 minutes of extra screen time. You can tweak and expand this system by having your kids earn chore sticks where they can turn them in for various privileges, outings or even an allowance. You could easily personalize this system to each child. The organized basket system in conjunction with the chore sticks could quickly turn around a lack of involvement in household chores if that’s an issue in your home and this ages and stages chart for chores will help you decide how to assign appropriately. We dig it because it includes personal hygiene in the mix with household – if your kids are fighting you on teeth brushing or changing their own clothes, add it to their responsibility list. Life with food can be a love-hate relationship. There’s the constant battle to keep things fresh, choose healthy over too indulgent, and to find ways to make prep work seamless and less frustrating. Buzzfeed recently posted 23 Hacks From Instagram That’ll Make You Say “Genius” and they were right. All of the hacks involved food and solving the above recurring issues. Our favorites? Keep asparagus fresh by cutting off the bottoms, and placing it in a mason jar of water. Create your very own at-home soft serve ice cream by placing your half gallon container in a gallon baggie, sealed up in the freezer and you’re good to go. In need of spreadable butter? Take a warm glass and place it over a few tablespoons from a stick, and it will be soft in a matter of minutes. Done deal. Mason jars + upcycled Dole containers = the perfect snack/lunch container hack when you need to separate items like crackers and chicken salad or cheese and crackers. Do you enjoy your bacon extra crispy? Use a waffle maker. Do you have a baby entering the world of solids but you’re not sure where to start, what age they should eat certain items, and how to naturally progress them through their eating journey? Check out this feeding timeline from BabyCenter and their age-by-age guide to read up on birth through the preschool years. Then head over to this comprehensive infographic at Newborn Baby Zone to give you ideas for what to feed baby throughout each age and stage. We’ll try to remember this the next time we’re weathering an epic tantrum with one of our kids.